Nutricost Apple Cider Vinegar 500mg, 240 Veggie Capsules - Extra Strength, Non-GMO and Gluten Free by Nutricost at Need to Diet. MPN: 3926473. Hurry! Limited time offer. Offer valid only while supplies last. 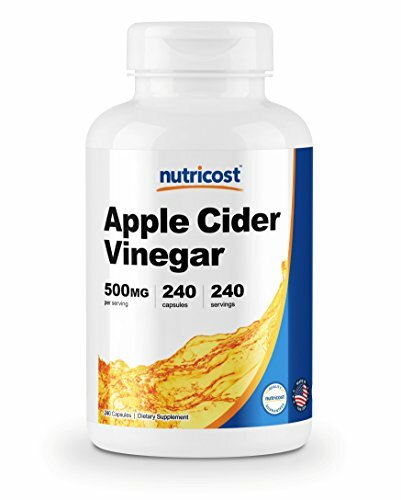 Nutricost Apple Cider Vinegar delivers high quality, pure apple cider vinegar powder in every capsule. Each batch is tested for quality and purity. Nutricost Apple Cider Vinegar delivers high quality, pure apple cider vinegar powder in every capsule. Each batch is tested for quality and purity. Apple Cider Vinegar (ACV) is the fermented juice of pressed, fresh apples. Sometimes used for cooking and cleaning, ACV has also been used for centuries as a traditional, natural remedy for a variety of health purposes. Nutricost Apple Cider Vinegar should only be taken in conjunction with a healthy diet. Do not exceed recommended dosage. Exceeding recommended dosage will not improve results. If you have any questions about this product by Nutricost, contact us by completing and submitting the form below. If you are looking for a specif part number, please include it with your message.